Sedona AZ home buyers are always intrigued by the spectacular views offered by the rock formations around Sedona AZ real estate properties. Use this guide to get to know the fabulous Sedona views. Bell Rock is one of the vortices that the New Age believers consider to be a point of special energy. Gibraltor are buff-colored cliffs on the edge of the Munds Mountain Wilderness Area, as designated by the U.S. Forest Service. Chapel of the Holy Cross was built on its location because the builder of the chapel looked across from her spot and saw the Madonna in this rock formation. Courthouse Butte was what Cathedral Rock was supposed to be called. And this formation was supposed to be called Church Rock. However, mapmakers changed history when they mislabled the formations and the names stuck. The Nuns are a pair of spires that don't look like nuns but are named because of nearby Chapel of the Holy Cross. During construction of the chapel, lots of religious clergy and nuns used to visit the spot. This Sedona Arizona guide begins with Lost Wilson Mountain. Lost Wilson Mountain has an elevation of 6,762 feet, and is called Lost Wilson Mountain not because it's small, but because it seems separated physically from the rest of the group of formations that include Wilson Mountain. 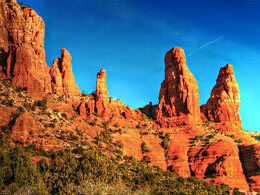 No Sedona Arizona guide would be complete without a description of Coffee Pot Rock. Coffee Pot Rock is a famous landmark where a small studio town was built in the 1940 by John Wayne for his film Angel and the Badman. Other westerns used the studio town at the base of Coffee Pot Rock, but then it was demolished in order to make real buildings... housing development. Bear Mountain did not get its name because it has bears on it. Bears don't really like rocky desert conditions! This peak looks like a bear from the distance. It stands 6,541 feet tall and has a trail to the top. The steep, difficult and hot trail is three miles long and you can see San Francisco Peaks in Flagstaff from the top. Wilson Mountain is 7,122 feet tall and named after Richard Wilson. Richard Wilson was a bear hunter who was killed by a grizzly in 1885. His body was found in Wilson Canyon, which is also named after him. This is the tallest mountain in Sedona, Arizona. A pass is a gap in a chain of mountains or other rock formations. Soldier's Pass is named after the soldiers who made their way through here from Fort Verde in the 1860s and 1870s. They camped here and fished and hunted and called it Camp Garden. Sugarloaf is a butte on U.S. Forest Service land. There's a forest on this butte, and since it's close to the actual city of Sedona, Arizona, makes a good weekend place for locals. It's called Sugarloaf Butte because sugar used to come in loaves in the days of the pioneers. The top of this butte was a good place apparently to loaf the sugar. Posse Grounds used to be a rodeo arena! You can see it in a famous old Western The Rounders. It's now a city park, since 1988 actually, and has picnic tables, ball fields, and a playground. Doe Mesa is a steep mesa which, if you climb to the top, has superb views of Red Rock Country and the Verde Valley. The trailhead in on Boynton Pass Road. The trail is steep, and a mile long. Capitol Butte is a mountain with a dome shape and stands 6,355 feet tall in elevation. In wintertime, the storm clouds will cover the top of Capitol Butte. It's also had several different names over the years: Thunder Mountain, Grayback, and Saddlerock. New Age followers believe there's a gigantic reservoir of crystals inside Capitol Butte, and others believe there's a lost city inside. Chimney Rock looks like a chimney but some people think it looks like a three-fingered rock. Lizard Head is a butte that looks like a lizard, whose tail is Devil's Bridge. Devil's Bridge is a natural sandstone arch. Ship Rock looks like a sailboat, with triangular sail floating over Sedona, Arizona. You can see this one from thirty miles away. Lee Mountain was named after a man named Lee. He was a pioneer in the Oak Creek area. Cathedral Rock has spires, which make people think of a cathedral. 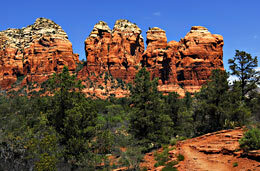 It's the most photographed area in all of Sedona, Arizona. Giant's Thumb is also called Thumb Butte visible from Schnebly Hill Road. Munds Mountain is 6,834 feet in elevation and named after the Munds family. They were important, powerful, rich people in the late 1800s heavily involved in politics. 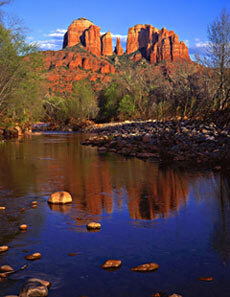 Twin Buttes sit together like twins under the blue sky of Sedona, Arizona. This is a slope with an old road on it that used to be the main route used by traders going to market in Flagstaff. Camel's Head is noted for its beautiful colors: orange and red and white stripes, so some people call it Tiger's Head. People see images near the ridgeline, like seeing images in a cloud. This is great: you can see Snoopy lying on top of his dog house, and it really does look like him! It's the famous scene of him lying on his back in profile. The nose is a block of limestone.